Last weekend I took some final pictures of the cabin before its inaugural year. We received our Certificate of Occupancy from the Town on the 16th. 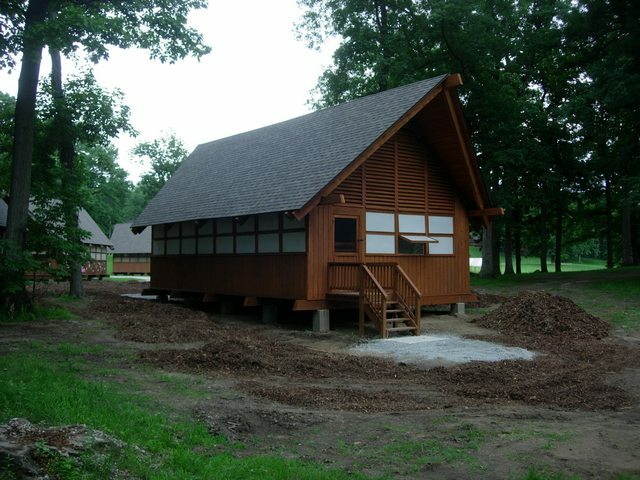 The Counselors moved into the camp last weekend on the 17th and the first batch of girls will be moving into cabin this weekend. While taking pictures, I was introduced to the Counselor for 2a, who had already moved in. When she was told that I was responsible for building it, she responded, “Cool! You Rock!” I took that as a pretty resounding endorsement. It’s a little hard to pick out since it has been stained to match the others, but you can see it east of Hwy 117, just across the creek and just south of the basketball courts. You can see some pictures of it under construction in previous posts here and here. 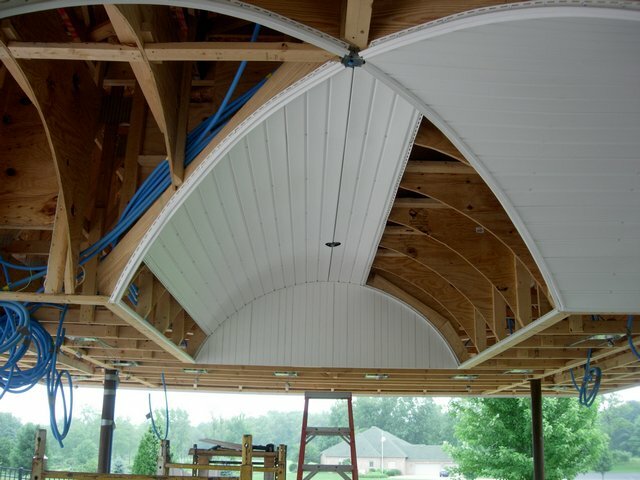 One of the more difficult parts of this project (previously discussed here and here) was achieving the crossing barrel ceilings. We had hoped that the truss manufacturer could provide the framework for this, but in the end, we only received square blocked out areas. Coming up with a way to frame this and then actually doing it was a challenge. This is the result, looking up at the area where the two barrels cross with the fireplace in the background. We are in the process of completing electrical rough-in now. Some of the ENT (Electrial Non-metalic Tubing) being used is visible in the picture. 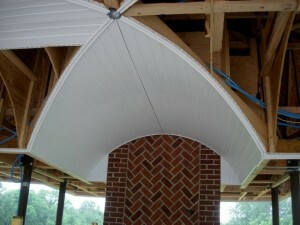 Once that is complete, we will be installing vinyl soffit material to form the ceiling itself. Vinyl soffit was chosen due to its flexibility in conforming to the barrel framing and its linear form that will accent the length of the barrels. The cabin is nearly complete. We are in the process of installing screens and window hardware. Shelving and electrical will follow shortly. It’s almost sad, but tomorrow all the beautiful cedar you see in the picture above will be stained to match the existing cabins. This will only be done on the exterior. The interior will be allowed to age naturally. 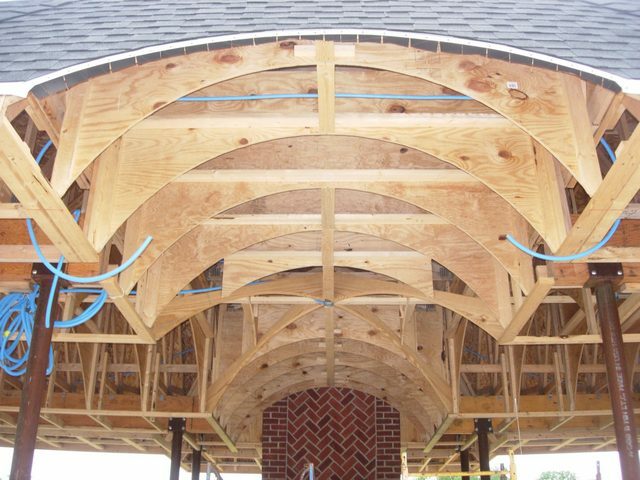 Both interior and exterior structural members are held together using custom plates bolted at the joints. 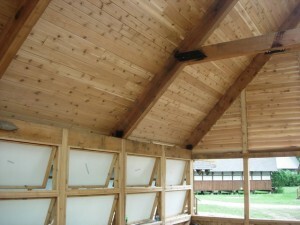 This is similar to the materials used originally. 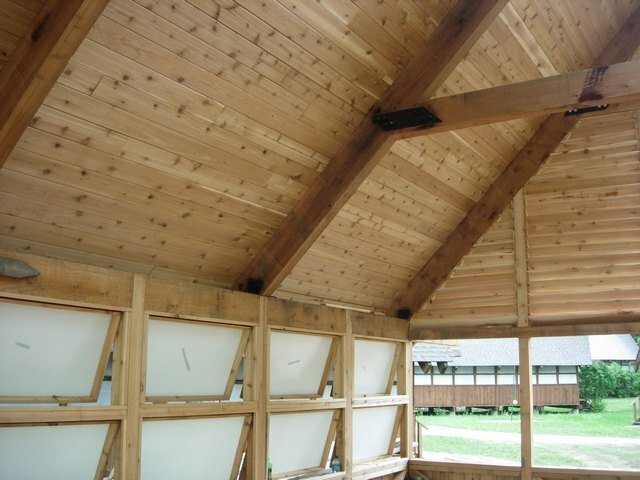 Siding and other wood members were assembled using non-staining galvanized nails. The roof deck is visible from the bott0m here. The deck is made from tongue and groove 2 x 6 cedar. 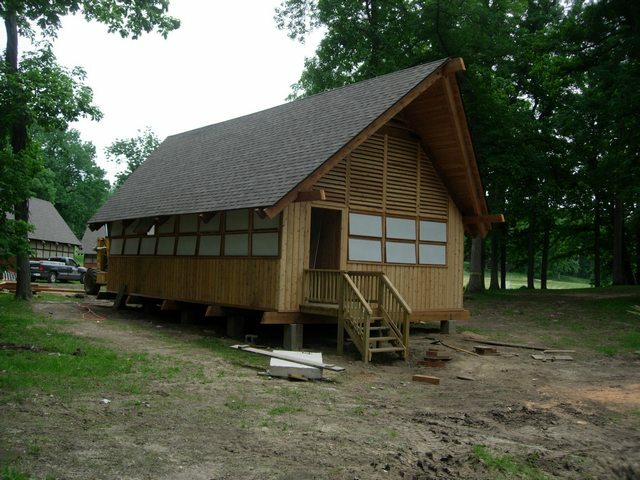 The cabin should be complete next week. None too soon as Woodcraft Camp will be starting shortly. We want to be out of there before 200+ elementary school girls take over this part of the camp! We previously told you about our work on an outdoor living project here. Indiana weather hasn’t helped us with progress this Spring. 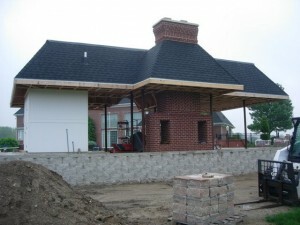 We had to wait for the weather to warm up enough to complete the masonry on the fireplace before we could make the tie-in with the rest of the structure. Once that happened in March, we were able to complete the framing, but then April came with nearly constant rain delays. 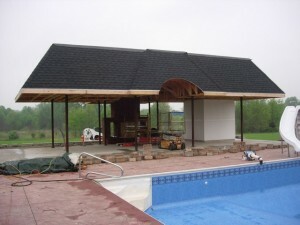 Since that time we have completed the roof structure, installed the shingles and the EPDM roof on the flat section. We have completed the barrel ceiling framing. We have also completed the perimeter retaining wall. Next on the schedule is the electrical rough-in. The Owners finalized the lighting layout and have made most of the fixture selections this week. We will be running the electric in flexible plastic conduit for maximum future options. The Owners use a computerized lighting and security system in their home. 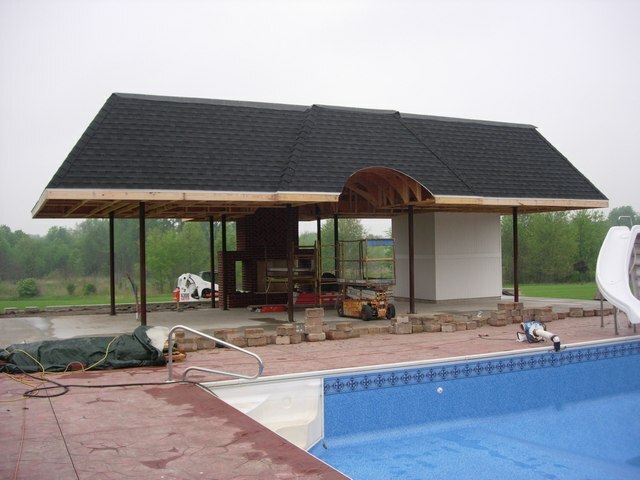 This system will be extended to the cabana to allow remote control of the lighting and other electrical systems. 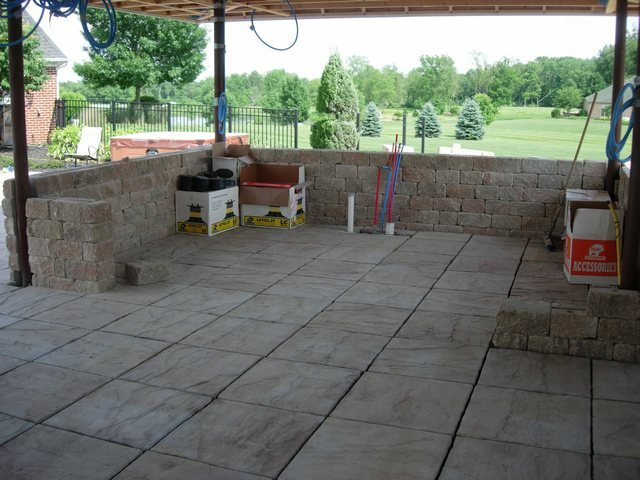 We are also about to begin the installation of masonry walls that define the room. The walls are solid core decorative retaining wall blocks that are designed for mortarless installation with vertical installation. The critical area will be around the kitchen area where the interior dimensions are crucial for the kitchen cabinets and appliances while the exterior dimensions are crucial to the column alignment and hurricane shutter locations. Check back for futher updates where we’ll have additional pictures of how it all comes together.